On Thursday 15 October the WA State Committee hosted a highly successful Sundowner event. The event was aimed at students, young professionals and anyone with an interest in food production and international agricultural development. 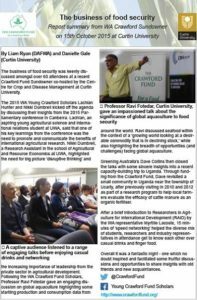 The Sundowner was jointly hosted by the Crawford Fund and the Centre for Crop and Disease Management at Curtin University. Over 60 attendees were treated to short talks from the 2015 WA conference scholars on the business of food security, a topic which was discussed at length during the event. Talks from industry professionals on their experiences in international research, development and policy work also took place, along with plenty of great networking opportunities. You can now view the report summary from the WA Crawford Sundowner, ‘The business of food security‘. To view the original event flyer click here.